I recently had the opportunity to listen, learn, and think at the Center for Information Management Studies at Babson College, and the topic, "From Web 2.0 to Enterprise 2.0," held much interest to me. The program was divided into two parts. Part 1 was some broad analysis, led by the wildly entertaining and insightful futurist (a/k/a "anthro-futurist teacher boy") Thornton May. Mr. May's analysis of what he calls über-patterns helped set the stage for Part 2 of the program, a case study of how Mitre Corporation is bringing Web 2.0 technology to their organization, and how they are measuring the value of doing so. Web 2.0 is 2-way, interactive, and personalized. Web 2.0 is dynamic, live, and real-time. Web 2.0 is ubiquitous and tightly integrated into people's lives. They need to actively govern them and to understand and measure their business value. Mitre uses objective metrics (e.g., listserv traffic, numbers of tags, wiki content, team sites, etc. ), and subjective techniques (e.g., surveys, interviews, feedback) to assess business value. Even so, they lack benchmarks to provide objective performance measures, and engaged a team from Babson College to research and measure Mitre's "technology-mediated networks" and their business value. The Mitre and Babson team presented their analysis of Mitre's social networks, including who collaborates with whom, what boundaries typically limit effective collaboration, and how effective collaboration tools improve productivity. The study is still in process, and I look forward to this research being published. It is of great interest to me and great import to business decision makers investing in collaboration and social networking tools. There was a significant amount of emphasis placed by Mitre on finding out "who knows what," with emphasis on searching for people rather than documents (emphasis mine). This is something our firm often discusses with our customers deploying KM and search tools. I was *very* surprised to learn that there are not explicit reward systems in place at Mitre for people who contribute to these communities and organizational knowledge stores. I hope to see more research in this area, because this was a surprise to me -- I wonder if this holds true in a different community or culture (i.e., not full of scientists/engineers who are trained to publish what they know in order to be peer-reviewed, recognized as experts, etc.)? 1. It lets me take my web favorites/bookmarks wherever I go. I can log into del.icio.us from any computer and see my bookmarks, which are stored "in the cloud." 2. It lets me view my favorites via a non-hierarchical "cloud." I'm becoming a bigger and bigger fan of this approach since I began storing my e-mail in a single "pile" and searching based on metadata and content (yes, I still have the blog article for "Everything is Miscellaneous" in process). In the case of e-mail, it's structured metadata (to/from, date, subject); using del.icio.us, it's tags that I assign and notes I can add. 3. It lets me see how other people tag pages that I have tagged. If I am interested in "Over Thirty Baseball," for example, I can tag my bookmarks with that term and can easily bounce to other links that other users have tagged with the same terms. Behold, social bookmarking! Of course, I can choose to share or not share bookmarks. For example, the link to my internal sales/marketing collateral library is probably not too useful to anyone outside the firm I work for. I'll be using this tool more and more at the expense of my traditional, browser-centric, hierarchical, single PC-bound, folder-nested bookmarks, which hadn't really changed much since Netscape Navigator and Mosaic were the browsers of choice in the mid-1990s. Del.icio.us is a rich and useful tool, but be advised: if you're importing 380 bookmarks like me, it takes a while to edit (they all come in as private) and tag them all. My colleagues at KMA just finished a new white paper examining three collaboration features in SharePoint (meaning for purposes of this discussion, Windows SharePoint Services 3.0 and Microsoft Office SharePoint Server 2007): discussion boards, weblogs (or "blogs") and wikis. They compare and contrast them, discuss use cases for each and suggest ways to most effectively use them in a portal or intranet environment. Until we revamp our internet site, I don't have a way of publishing it to a structured external-facing repository, but in the interim, I will gladly send you the .pdf if you send me an e-mail request for it. Simply put "discussion board/blog/wiki" in the subject line, and I'll send it right out to you. What do these applications have in common? but it was eye-opening to me nonetheless. People are so used to linking and jumping to relevant content, they are doing it in real-time and opening up new threads as they consume in-person presentations. When the company "Threadless Tees" was mentioned during the keynote, probably 10-20 users in the audience were looking at the site within 30 seconds. There are a lot of people skeptical about web 2.0 and enterprise 2.0, but there can be little doubt that new tools are being used every day to richen and accelerate the information that knowledge workers use. I saw it firsthand yesterday. I read this when I was away a few weeks back, and Nicholas Carr's recent post about "The People Formerly Known as the Informed" gave me a fresh perspective on the topic. 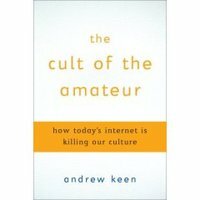 Andrew Keen, in his book, "The Cult of the Amateur: How the Internet is Killing Our Culture" has taken an unpopular position, at least (certainly!) among the "digiterati," and made an interesting case for it. In this book, he tells us how the "New Media" of the Web are, in his words, "killing our culture." As user-contributed, free content proliferates, expertise is devalued and media and culture are reduced to a mass-market least common denominator, eroding valued cultural institutions that have taken several decades to form. While Keen is a compelling storyteller and richly illustrates the problems, I found the degree to which he indicts tools, media, and entire markets for individuals' misbehavior off-putting after a while. There are systemic problems with today's media and Internet that need fixing: protection of minors, privacy, and intellectual property, and I felt that Keen spent too little time drilling down on potential solutions and too much lamenting, for example, the demise of the local record store with the quirky but good-hearted clerk willing to make just the right recommendation. Andrew Keen has been writing and speaking on this topic much as Nicholas Carr has done with "IT Doesn't Matter," and, although it shouldn't be surprising, I must admit that I giggled a bit when I learned that Keen, philosophically opposed to such user-contributed content and vanity projects, has a (to his, credit, interesting) blog. Cult of the Amateur is a thought-provoking and lively read, and on one very base level, it makes me want to see Keen and James Surowiecki in a steel-cage match to see whose cultural paradigm reigns supreme.